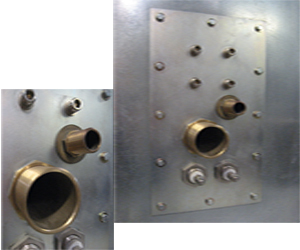 Shielded Enclosures are a confined space and ventilation is an important requirement. To provide air flow into the enclosure and still maintain the shielding integrity, special vents are required. These vents are constructed using a metallic honeycomb wafer soldered into a steel frame. A minimum of two air vents are required for each enclosure, with one providing the fresh air entry and the other the exhaust. Power Filters are used to attenuate signals traveling along the power cabling as it passes into the RF shielded enclosure. A two line 32A mains power filter is normally supplied with each enclosure, however the filter configuration can be varied to cater for client requirements including 3 phase, different supply frequency, Voltage, Current, Leakage to earth and Performance. In order to pass physical connections such as coaxial cables, fibre optic cables and DC power and signal lines into an RF shielded enclosure a Penetration Panel is required. 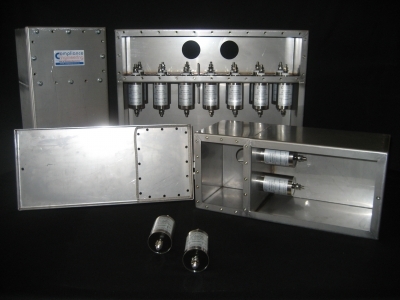 The penetration panel can be configured to client requirements with N type coaxial connectors, brass waveguide penetrations and signal/power filters. Beryllium Copper (BeCu) contact finger strip is applied to the RF shielded enclosures door frame to create an RF seal with the door. 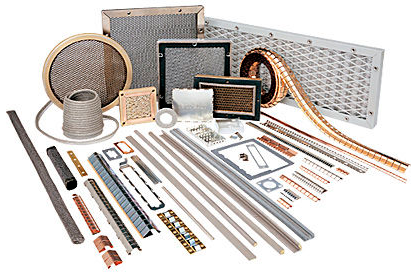 Compliance Engineering can supply a range of beryllium copper (BeCu) contact finger strip, specialised RF gaskets and conductive adhesive tape for use in your shielding application.